"Jack Goes Trick or Treating"
In ancient times on the British Isles, the Celtic peoples celebrated the festival of Samhain. The festival, which was about halfway between the Autumn Equinox and the Winter Solstice, signified the end of the harvest and the beginning of "The Dark Half" of the year. During the eighth century, Christians in Britain co-opted Samhain as Allhallowtide, a three-day observance centered on All Saints or All Hallows Day, a "time to remember the dead, including martyrs, saints, and all faithful departed Christians." At Samhain, the division between everyday life and "the Otherworld" was particularly thin. This meant that spirits and fairies had an easier time coming into our world, often accompanied by ghosts of the dead. This belief carried over to Allhallowtide. All Saints Day, November 1, became a time to revere those who had passed from this life while All Hallows Eve, shortened to "Hallowe'en", became the time to deal with the spooks from "the Otherworld". Dealing with spooks and monsters is serious, sometimes frightening business, especially when you consider that a mistake can cost your very soul! While ghosts, spooks, and monsters are doing their best to scare us, the best way to scare them off is with happiness and laughter. So when we hold a Halloween Party, take a kid Trick-or-Treating, or stand around an autumn bonfire with friends, we are doing more than just having fun, we are keeping the monsters at bay! According to Smithsonian, Trick or Treating began in the Middle Ages as people would dress up as spirits and demons and go to houses begging for food and money. During the 1920s, the holiday was popularized in the United States. After the sugar rations of WWII, Trick-or-treating came back into favor in America and in media including radio shows. The Chase and Sanborn Hour, October 30, 1938, Bergan decides that he will not throw a Halloween party for Charlie this year after so many windows got broken last year. Instead, he'll tell everyone a ghost story, if they will just let him! Historical Note: This is the program which was playing on NBC while Orson Welles was scaring the nation with his War of the Worlds broadcast on CBS. Fibber McGee and Molly, October 24, 1939. There is a fun party going on next door to the McGee's at Throckmorton P. Gildersleeve's. As part of a gag, Fibber sneaks into Gildersleeve's garage and lets the air out of the tires. What he doesn't know is that Gildy's car is at the mechanic's shop, so he pulled Fibber's flivver into the garage to protect it from Halloween pranksters. The Jack Benny Program, October 29, 1939. Jack is throwing a Halloween Masquerade party at his house for the gang. Everything should go well, Jack has asked Dennis Day's mom to help get everything ready. Wait a minute, doesn't Mrs. Day hate Jack? Fountain of Fun, October 25, 1942, WLW Cincinnati, sponsored by Milky Way Candybars. Host Bobby Jellison (later playing "Bobby the Bellhop" on I Love Lucy) is the soda jerk at the Fountain, and he is getting ready for the boss's Halloween party. This gives us plenty of opportunity for WWII jokes. Note: Jellison was the subject of Bobbywood: The Longest Death Scene at the 2013 Hollywood Fringe Festival. 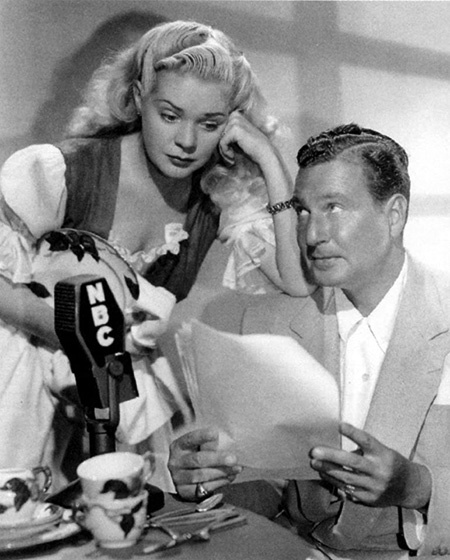 The Great Gildersleeve, October 31, 1943. Gildy knows that it is a waste of time to ask Leroy to stay out of mischief, but he hopes that he can stay out of jail! 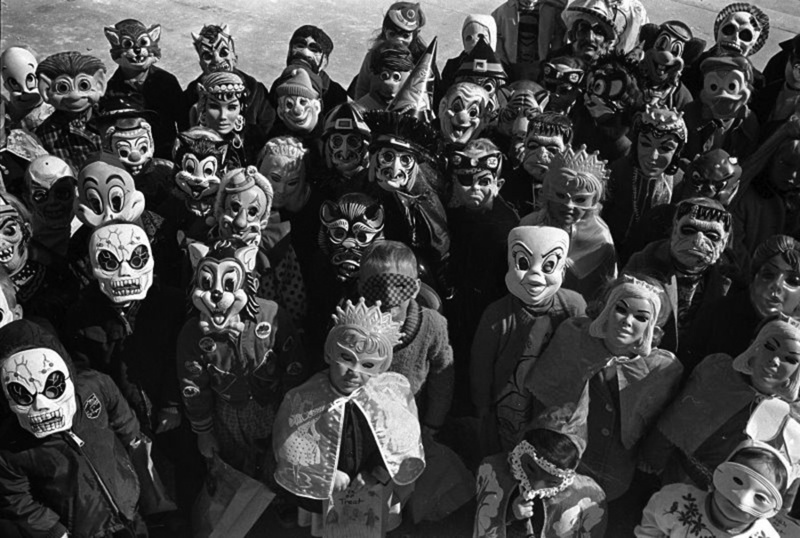 Leila Ransom talks Gildersleeve into holding an old-fashioned Halloween party. Somehow, both Leila and Eve Goodwin get invited to Gildy's party, so just imagine the fireworks! Is it Halloween or the Fourth of July? Our Miss Brooks, October 30, 1949. Walter Denton is planning on inviting Connie to his Halloween party, what she doesn't know is that he is planning to hold it at Connie's place! It is not such a bad idea, especially since Mr. Boynton is coming too. 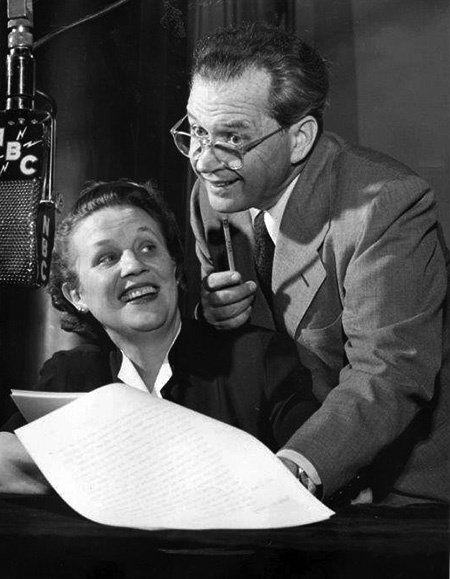 Fibber McGee and Molly, September 15, 1957. Fibber has come up with a way to take the frustration out of raking autumn leaves, and it works as well as his other schemes. Truth or Consequences, October 30, 1948. Mrs. O'Sullivan's consequence is to be blindfolded and taken to a haunted house in Milwaukee. What she doesn't know is the haunted house is her own living room. The other part of the gag is having Boris Karloff dress up as a fortune teller. The Adventures of Ozzie and Harriet, October 31, 1948. Ricky and David are going Trick or Treating, but Ozzie is determined to find some ghosts at a nearby haunted house. Be the first to comment on "Halloween Comedy Capers"